The sockets and attachments in this 17 piece 1/4" drive 6 point standard metric set feature outstanding corrosion resistance as a result of our proprietary in-house plating process. Each socket is made from premium tool steel for maximum durability and has a distinct brilliant jewellery-like finish. The included high torque ratchet features a closed back which reduces potential ratchet mechanism damage from dirt and debris. Made in Canada and backed by Gray Tools worry-free lifetime warranty. Contains: 4, 5, 7, 8, 9, 10, 11, 12, 13, 14, 15mm sockets, Reversible Ratchet, U-Joint, 2" & 6" Extensions and Hand Driver. Ideal for use on stubborn, damaged or worn fasteners. The sockets in this 12 piece 1/2" drive 6 point metric standard chrome socket set feature outstanding corrosion resistance as a result of our proprietary in-house plating process. In addition, Gray sockets are made from premium tool steel for maximum durability and feature a distinct brilliant jewellery-like finish. Made in Canada and backed by Gray Tools worry-free lifetime warranty. The sockets in this 21 piece 3/8" drive 6 point metric standard chrome socket set feature outstanding corrosion resistance as a result of our proprietary in-house plating process. In addition, Gray sockets are made from premium tool steel for maximum durability and feature a distinct brilliant jewellery-like finish. Made in Canada and backed by Gray Tools worry-free lifetime warranty. The sockets in this 8 piece 1/4" drive 6 point SAE standard chrome socket set feature outstanding corrosion resistance as a result of our proprietary in-house plating process. In addition, Gray sockets are made from premium tool steel for maximum durability and feature a distinct brilliant jewellery-like finish. Made in Canada and backed by Gray Tools worry-free lifetime warranty. The impact sockets in this 5 piece 3/4" drive metric hex head impact socket set feature outstanding corrosion resistance as a result of our proprietary in-house plating process. In addition, Gray sockets are made from premium tool steel for maximum durability. Precision tip ensures a tight and secure fit with the fastener. Made in Canada and backed by Gray Tools worry-free lifetime warranty. 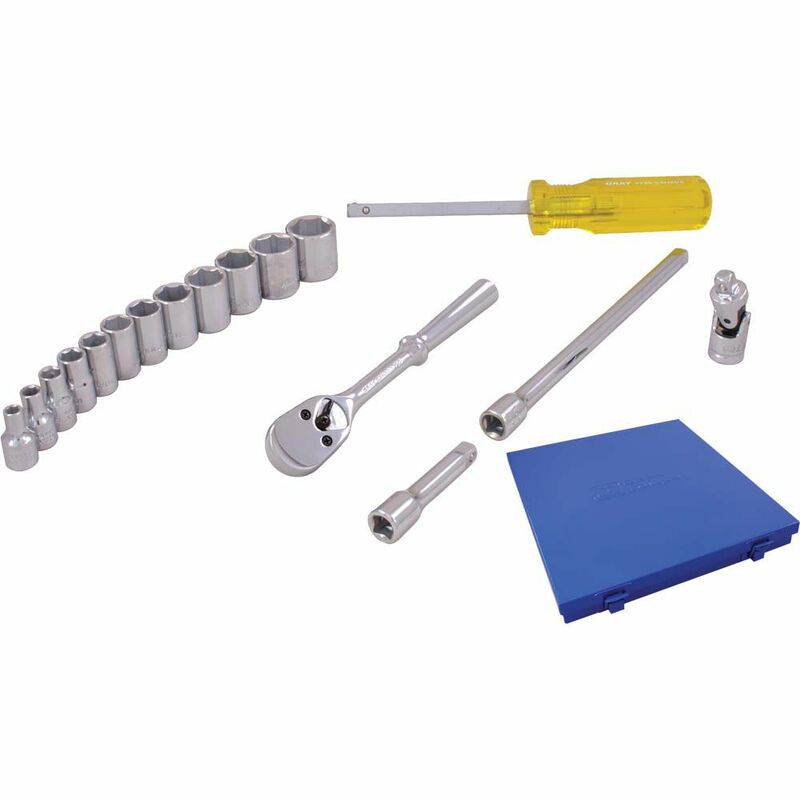 Socket & Attachments Set 17 Pieces 1/4 Inch Drive 6 Point Standard Metric The sockets and attachments in this 17 piece 1/4" drive 6 point standard metric set feature outstanding corrosion resistance as a result of our proprietary in-house plating process. Each socket is made from premium tool steel for maximum durability and has a distinct brilliant jewellery-like finish. The included high torque ratchet features a closed back which reduces potential ratchet mechanism damage from dirt and debris. Made in Canada and backed by Gray Tools worry-free lifetime warranty.